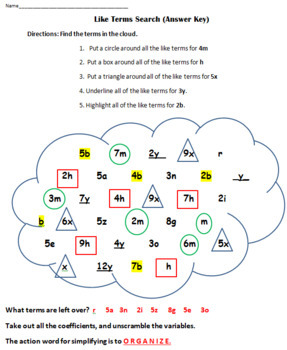 Students will search for the like terms in the cloud. They will have different shapes or directions for each group of like terms. Leftover unlike terms will then be recorded at the bottom, the variables of the unlike terms will have to be unscrambled to spell out the word "Organize". Here is a NEW more advanced level of like terms. It has exponents, double variables, negatives, fractions, and decimals. If you like this item, please rate it and check out my other items! !